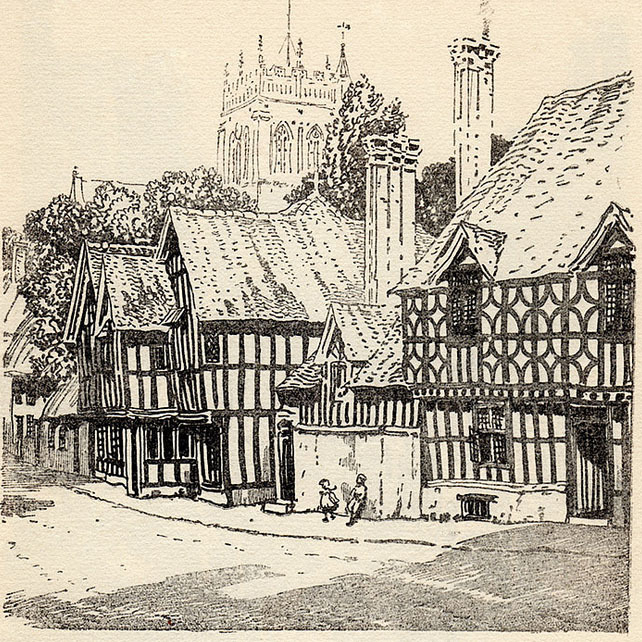 “POTTERNE, a village, a parish, and a hundred, in Wilts. The village stands 2 miles S by W of Devizes r.station, and has a post-office under Devizes. The parish includes the tythings of Marston and Worton, and is in Devizes district. It was here that James Biggs was born in August 1764. His father, James, was 40 and his mother, Mary (nee Miel), was 43. He was baptised in the Parish Church at Potterne on 26 Aug 1764. (England Births and Christenings, 1538-1975). He was the youngest of seven children born to his parents. Old houses in Potterne. Leaves from the west of England Sketchbook of A E Newcombe. Flickr. He was born at a time when rural England was prospering. Large quantities of corn were being exported to the Continent from the farms where there was a surplus to their own requirements. Its price was pushed up by a protectionist policy and land became a good investment. James, along with his older brother George, worked on the farm from an early age. Each season requiring a range of tasks to be completed, from the sowing of grains, potato planting, haymaking, fruit picking and harvesting. James was taught to read and write – the need to read even in rural areas was seen to be important especially as education was often church-based and reading the bible and religious tracts part of everyday life. There was a steadily developing usage of the printed word in everyday life from newspapers, tradesmen’s announcement to gravestone epitaphs. He married Ann White on October 18, 1787, in Potterne, Wiltshire. Both Ann and James were born in Potterne and they probably knew each other from childhood. He was 23 years old at the time of their marriage and Ann was 24. Normally Banns were announced in the church on three separate Sundays during the three months leading up to the wedding day to give the congregation an opportunity to voice any objection to the marriage. However, James and Ann obtained a licence instead and were required to sign a statement to determine their ages, marital status, place of residence and included an oath that there were no impediments to the marriage. A bond was also sworn, by Jonathon White, the bride’s father, pledging a substantial sum of money, that would be lost if any impediments were found. Arranged marriages for money, land, etc. were the norm of the time. People were so used to these economic arrangements that love was not expected in a marriage. The reason for their haste and need to be married by licence was that Ann was already six months pregnant at the time so it looks like economic arrangements were not the only reason. The wedding took place just three days after the licence was issued. Her sister, Sarah, was also married by licence (her father was also bondsman for this licence) on the same day to George Grant, a licenced victualler and she was also pregnant at the time of the marriage. Although there is a beautiful medieval church in Potterne both the White and Biggs families were dissenters who had separated from the Church of England and opposed state interference in religious matters. On 26 Sep 1787 only a few weeks before the marriages took place, the house of George Biggs was licensed for nonconformist worship. There is no religious organisation ascribed to their gatherings, such as Quaker or Methodist, but rather Independent. Johnathan White, George Biggs, William Biggs, James Biggs and Robert Hampton were all signatories to the licence as “housekeepers” (Wiltshire dissenters meeting house certificates and registrations 1689-1852). It is most likely that both couples would have married at the meeting house with the ceremony being performed by an itinerant preacher. It is difficult to assess the size and location of the Biggs farm, except that James and Ann were residents of Potterne. In 1851, near the end of his life, he had 26 acres and was employing one agricultural labourer in Worton, the county for Potterne. This would probably have been much larger during his earlier life and census records show adjoining properties being farmed by family members including his oldest son, George. James was undoubtedly a respected member of the community. He is described as a Yeoman of Worton, from the parish of Potterne (Source: Wiltshire Deeds held by Wiltshire and Swindon History Centre). This meant that he was “a person qualified by possessing free land of 40/- (shillings) annual [feudal] value, and who can serve on juries”. He was also appointed Tythingman for Marston, leading a small group of approximately 10 neighbouring families in what was an early form of community policing. (Source: Potterne Court Rolls 1719 – 1861). The Reckoning. 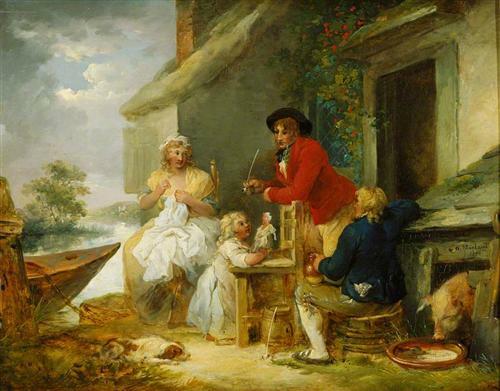 George Morland 1800. 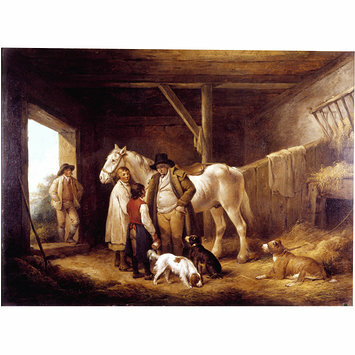 A Farmer paying the Ostler and Pot boy at an Inn. In agricultural families, men, for the most part, took care of the majority of the household income. Households were first and foremost a patriarch; they controlled every instance in the house. Men did the heaviest labour in the field such as clearing, ploughing, sowing seed, harvesting, and threshing. This was also with the help of their sons and hired labourers. While wives were regarded as subordinates, their role was critical, helped by their daughters or servants as well as the normal housekeeping and cooking, they did everything from caring for poultry, beekeeping, preserving fruit and vegetables, cheese making, beer and wine making, sewing, carding, spinning and knitting wool; tending to the animals; to teaching the children. They took care of most of the internal tending in the household as it was commonly seen as women’s chores. 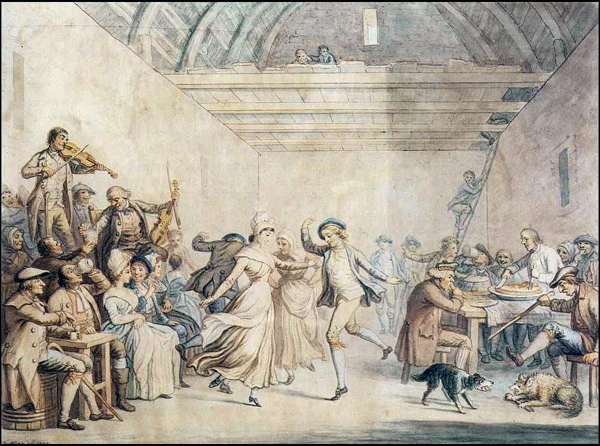 While farming in the 18th century was hard work time was still found to celebrate and enjoy life. They regularly travelled to the local markets, probably in the larger neighbouring town of Devises to sell their eggs, butter, cheese and other produce. Village sports were held on the village green and were a great source of enjoyment. The sports included cricket, ‘bandy’ (hockey), and rounders. Every season of the year had its holiday customs, Following the busy harvest-time, when everyone was too hard at work, and too tired at the end of the day’s labours, to think of holiday-making came the harvest home, when the last sheaf was gathered in, and there was a harvest feast along with customs such as ‘scrigging’ or knocking down the small apples left after the gathering of the main crop. This was done with ‘squailers’ (throwing sticks). The winter of 1794-1795 was excessively severe. Both his father, James, and sister, Jane, died in 1795 seeming to herald the difficulties that James was to face in the years ahead. 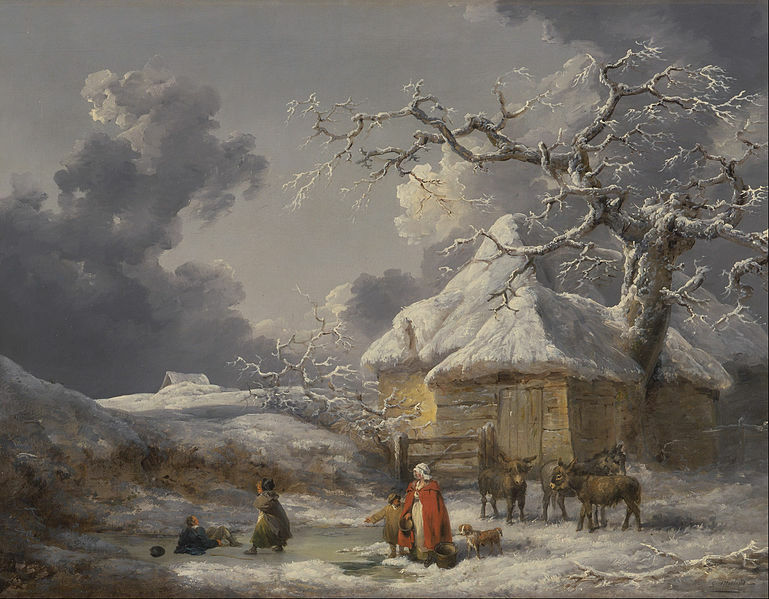 The latter part of the 18th Century was labelled a “mini ice age” with icy cold conditions lasting most of James and Ann’s married life. In 1776, one of the coldest on record at -18c, just before sunrise, rivers were completely frozen and there were snowdrifts up to 10 feet deep. The bleak and cold conditions made farming very difficult. Britain had spent a huge amount of money fighting the American Revolutionary War between 1765 and 1783. The national debt had increased and as a result, taxes were raised. The trade which Britain relied on for wealth had been severely interrupted, with imports and exports experiencing large drops and the recession which followed causing stock and land prices to plummet. By the 1790’s England was overshadowed by the cloud of yet another war with France declaring war on Britain in 1793. The war lasted nine years and resulted in bread shortages and the recruitment of able-bodied men depleting the rural areas of much needed labour. At the outbreak of war, James Biggs and his brother, William became active members of the Yeomanry Cavalry of Wiltshire established in 1794. These Yeoman cavalries were formed in order to increase the level of protection against a potential French invasion. The Yeomanry never served overseas and took no part in the Napoleonic wars, however, it was called to deal with civil disorder such as a mutiny by the county Militia in Devizes and the Swing Riots. Whether it was the severe cold or the scarlatina epidemic that swept through England between 1797 and 1799 both his mother and daughter, Mary died in August 1798. At the time of their death, his mother was 77 years old and his little daughter Mary only one year old. The 1841 records James as living with his wife and two servants in Potterne. In July 1842 his wife passed away at the age of 78 years. They had been married for 54 years. 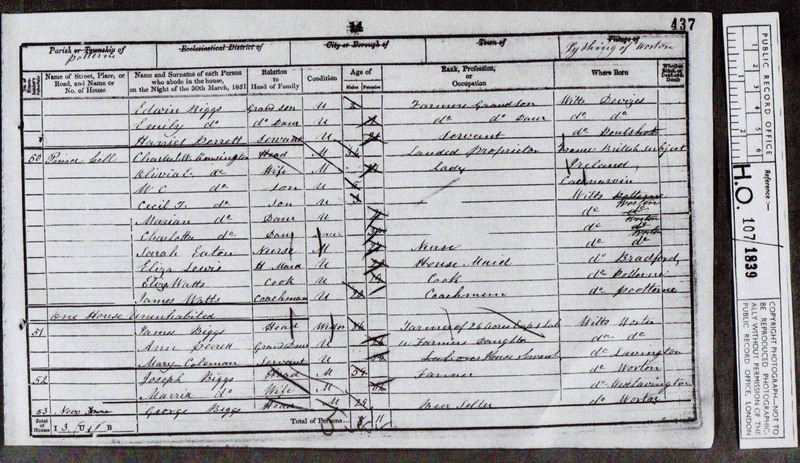 The 1851 census shows James Biggs living in Potterne, Wiltshire, with his granddaughter and one servant. The census shows his family living in nearby properties. James Biggs died in September 1852, in Devizes, Wiltshire, when he was 88 years old. There was a worldwide outbreak of Cholera that passed through England at this time and this could be a possible cause of death. His death is recorded in the Wiltshire Memorial Inscription Index and shows he was buried at Worton on 18 September 1852.